None of the 16 publicly-confirmed lawyers on special counsel Robert Mueller’s team are registered Republicans, The Daily Caller News Foundation has found. Voter registration records indicate that 13 of the attorneys are Democrats and three have no party affiliation. This is the first time the political affiliation of all 16 lawyers has been reported. One of the lawyers, Zainab Ahmad, appears to have registered as a Republican at the age of 18, but has since changed her registration status to unaffiliated. There is a 17th lawyer on the Russia probe, but this person’s identity and political affiliation remain unknown. The special counsel’s office has previously disclosed that nine of the 16 lawyers have made a total of $62,000 in donations to Democrats, with one of those nine lawyers having also donated $2,750 to Republican candidates. However, that analysis only looked at donations found in Federal Elections Commission records. TheDCNF has uncovered two additional Democratic donors by searching for all donations – regardless of party – recorded in campaign finance databases at the state level. 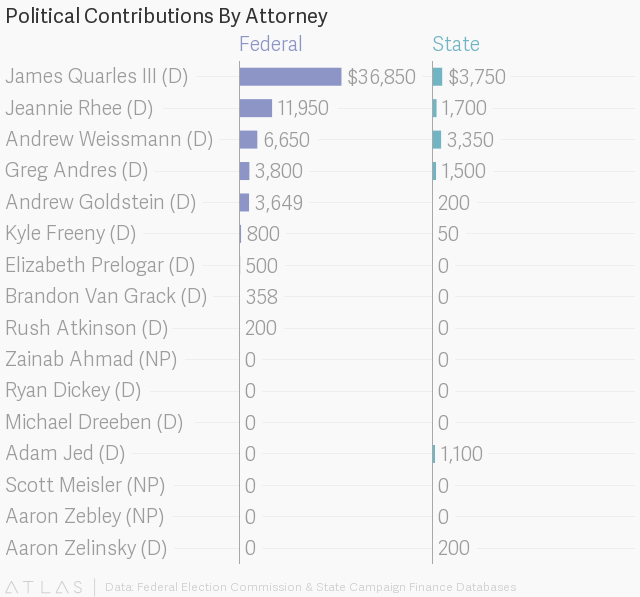 Adam Jed, an appellate lawyer for the Justice Department, made two donations in 2017 – $1,000 to a Democratic candidate for Wisconsin attorney general and $100 to a Democratic candidate for Baltimore state’s attorney. Another DOJ lawyer, Aaron Zelinsky, donated $100 in 2014 to the Branford Democratic Town Committee in Connecticut and $100 to a Democratic state lawmaker in 2016. That makes 11 lawyers on the Mueller team who have donated to Democratic campaigns. Nearly $12,000 in total contributions were found in state databases, all of which were donated to Democrats. Mueller, a registered Republican, is not included in these figures, but the former FBI director has donated to Republicans both statewide and nationally. As his team has grown, details about the lawyers hired by Mueller have fueled accusations of political bias on the probe investigating whether the Trump campaign colluded with Russia to influence the 2016 presidential election. Andrew Weissmann, an early member of the probe, attended former Democratic nominee Hillary Clinton’s election-night party in New York City. In January, he sent an email to then-acting Attorney General Sally Yates, praising her for refusing to enforce President Donald Trump’s travel ban. “I am so proud and in awe. Thank you so much. All my deepest respects,” he wrote. Mueller removed FBI agent Peter Strzok last summer after Strzok sent a colleague dozens of anti-Trump text messages. TheDCNF more recently uncovered that Zelinsky had written overtly partisan articles for the liberal news outlet HuffPost. The special counsel’s office declined to comment for this article beyond emphasizing that DOJ guidelines prohibit Mueller from considering political affiliation when making hiring decisions. And defenders of the investigation point out that Andrew Goldstein, who donated thousands to the Obama campaigns in 2008 and 2012, prosecuted a powerful Democrat – former New York State Assembly Speaker Sheldon Silver – on corruption charges in 2015. “Lawyers of course have political opinions, but they routinely leave partisan attachments aside when prosecuting cases,” wrote the Bloomberg editorial board in January. Yet the growing list of Democratic donors have led some to wonder whether any of the lawyers on Mueller’s team are Republicans. James Quarles, a former assistant prosecutor on the Watergate investigation, did make two donations to Republicans, including a $2,500 contribution to Republican Rep. Jason Chaffetz; however, Quarles has also donated nearly $38,000 to Democratic campaigns. No other lawyers working for Mueller are known to have contributed to Republican campaigns. Jeannie Rhee, a former partner at the law firm WilmerHale, maxxed out her contributions to Clinton’s presidential campaign in 2015 and 2016 and donated thousands to the Obama campaigns in 2008 and 2011. State campaign finance records reveal that Rhee also donated to local Democrats in states like Rhode Island, Massachusetts, Ohio and Virginia. Records show that Weissmann, the former head of the DOJ criminal fraud unit, was also a frequent Democratic donor in New York, including a $1,000 contribution he made to Andrew Cuomo’s bid to become attorney general in 2006. Only two registered Democrats did not make political contributions.